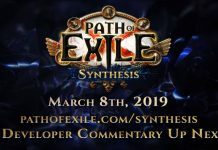 Before we jump in, you should know that this guide is going to be focused around one of the strongest builds in Path of Exile right now. The purpose of the Path of Exile Molten Strike Juggernaut build is to push low Delves and have a very smooth experience leveling to 100. This build is not cheap, although you can start it on a budget of around 10 exalts. 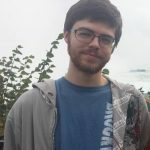 We will go over the parts that are necessary, but if you’re looking for a starter guide, this simply isn’t the place to be. However, if you’re looking for an end-game currency sink, you’ve found a strong one. Let’s give some credit to the build’s original creator: MrsDeath. This is the perfect build to play in the best league so far. Now, let’s take a look! This build is based around two Nebuloch maces. Nebulochs are weapons dropped by Elder, and they are based around endurance charges. For each endurance charge you have, Nebuloch gives you more damage and resistances. However, it also deals damage to you. The idea of this build is to build as many endurance charges as possible, and get enough life regeneration so that you aren’t degenerating from the Nebulochs. As long as you can manage that, which isn’t particularly hard, then most of your remaining stats can be focused around survivability since the Nebulochs will provide most of the damage. The second key part of this build is a Watcher’s Eye that reads: “Life gained for each enemy hit while affected by Vitality.” Because there are so many projectiles from the Molten Strike, it can easily heal you back to full health with one or two attacks, and you can attack 5+ times per second. There are a few core items for this build, but only three of them are particularly pricey. The Watcher’s Eye (mentioned above) is vital. You will also need to get a helmet with the labyrinth enchant “Molten Strike fires 2 additional projectiles.” There are a couple ways you can buy this, which I will explain. These are the only two necessary items in the build that cost more than 100 chaos. The last expensive and necessary item is a Dying Sun flask. Make sure you get one that does NOT have ‘increased charges’ on it. Find one that is neutral or reduced so that you can use it twice. Everything else can be expensive, but you can work towards it with the build itself. You will obviously need two Nebuloch maces, and you should get two Kaom’s rings. You will want Kaom’s Way, since they give regeneration, but if you cannot afford them then start off with Kaom’s Sign. Ways are only about 50 chaos, give or take, and should be one of your first upgrades due to their quality of life. You will also need a Wildfire unique Jewel, but you are given one in Act Five for free. Your boots should be Kaom’s Roots (don’t worry too much about the rolls). Your gloves should be Tombfists, but if you need to use rare gloves at first to cover resists, that’s fine. Your amulet should be a Xoph’s Heart eventually, but when you start out you can use a rare amulet with some elemental damage. Make sure to take Avatar of Fire on the tree, since we path right past it. Xoph’s should be your first big upgrade, as it gives a huge bonus to this build. Your body should be a Loreweave with 80% resistances. You’ll obviously want a 6 link, but if you can’t afford one a 5 link will be fine to start off with. This will cost you around 80 chaos at current prices. You’ll notice that we’ve listed most of your items, and they don’t have a lot of resists. You’ll fill out most of your resists through jewels on the tree, as well as your belt. For your flasks you’ll want the aforementioned Dying Sun, a Wise Oak, a Blood of the Karui, and a Silver and Quicksilver to round things out. Make sure you have curse removal on the Silver flask. Try your hardest to make your Lightning and Cold resistances equal for the Wise Oak. For your helmet you’ll need to get one with the two extra Molten Strike projectiles, as mentioned. There are three ways to go about this, and all three use rare items. You can either buy one that is fully crafted, buy one and craft it yourself, or buy a low cost mirrored one. 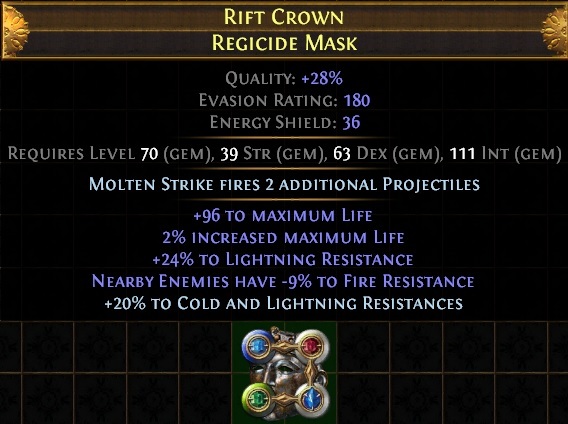 People mirror their decent helmets with the Bestiary recipe, which allows you to buy one with decent rolls for a lower price. Note that you will be unable to change it any way, including socket colors. This is fine for a starter item, but you’ll likely have to replace it later. I bought a good base and crafted it myself. There is one modifier in particular that you are looking for, which is “Nearby enemies have -9% to Fire Resistance.” In order to craft this you’ll need to use a Scorched Fossil. 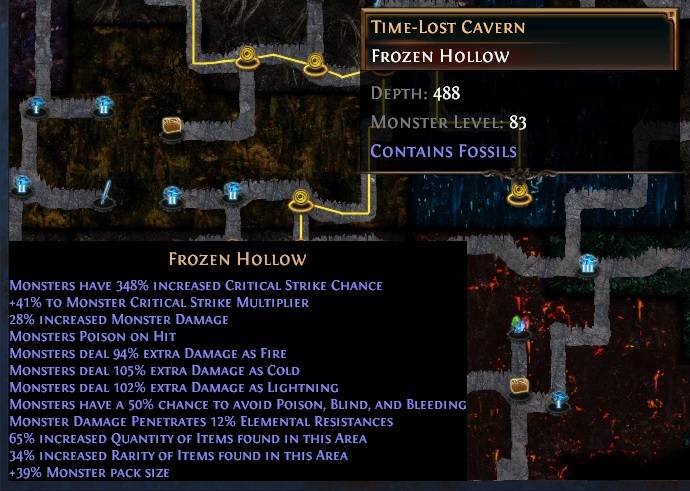 Since we’re using fossils anyway, I suggest using a Pristine Fossil as well, which will allow you to roll the decent life rolls. Basically, you want a high life roll and the -9% roll, and hopefully at least one resistance as well. This is mine. It took me around 5–6 rolls, and I have made a few others in similar numbers. Molten Strike Juggernaut Helmet example. 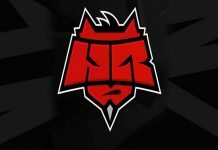 Image via EsportsEdition. Below are the gem links you’ll need for the Molten Strike Juggernaut build, with short explanations after each one. Your damage setup, in order of importance, in case you have a five link. This is a huge defensive setup. We don’t use Enduring Call since it removes endurance charges. Instead, it will shoot out balls that hit quite often, and send your life flying back up while gaining life on-hit bonuses. Combustion simply allows for more damage to be dealt afterwards. Last 3 gems, no link necessary: Blood Rage, Enduring Cry, Herald of Purity. These are all fairly self-evident. Enduring Cry is necessary to start off deep delves or hard maps, since getting hit to start generating charges is scary. The heralds are increased damage, as well as bodies from Purity, although you can replace Purity with Arctic Armour if you feel it’s necessary. Once you have a 6 link Loreweave, Xoph’s Blood, two Kaom’s Ways, and a well rolled helmet, there are a few big upgrades remaining. 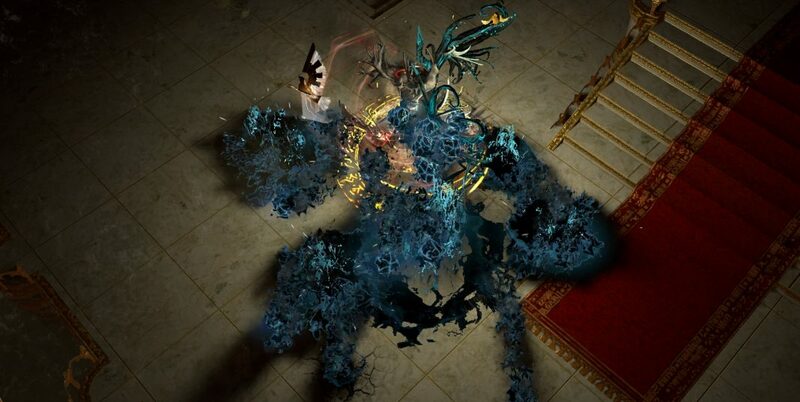 First and foremost, replace your Kaom’s Roots with a Kaom’s Roots with the +1 to Maximum Endurance Charges corruption. This will set you back, especially if you get one with a good life roll. Second, get a Nebuloch with chance to Fortify on Melee hit. This allows you to easily keep Fortify up, which will provide a huge defensive boost. Lastly, get Tombfists with either Curse Enemies with Elemental Weakness on hit, or Curse enemies with Enfeeble on hit. I think Elemental Weakness is better. Since you need three links you won’t be getting one with two abyssal sockets, meaning it will be expensive, but not prohibitively. Also replace your Wildfire with a Wildfire that has “Corrupted Blood cannot be inflicted on you” for a small quality of life bonus. Hardest node possible, done with ease. 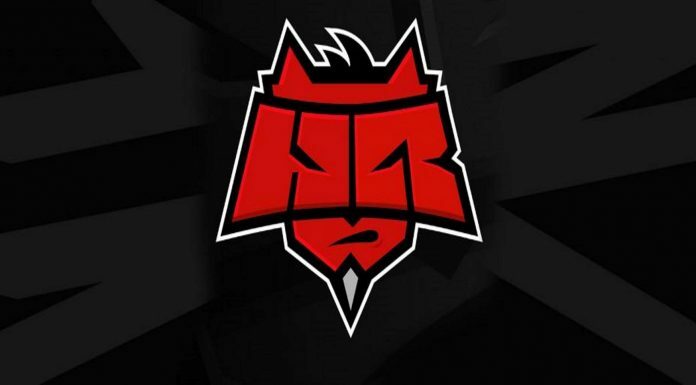 Image via EsportsEdition. This node has literally every single damage mod possible, and I was able to complete it in a single go at level 97. This build is crazy-strong defensively. There is, however, one thing you should change for deep delves: remove your Silver and Quicksilver flasks and replace them with a Topaz and Sapphire flask. They should have Curse and Shock removal on them. If you can make all three of your resistances equal, that will help as well. These things combined will boost your elemental resistances significantly, and remove the danger that shock presents. This is the build that I’m running for Betrayal, and I love it. I’ve been gravitating towards more defensive builds lately, and pushing for 100 has become one of my favorite things to do. This build has it all: more defenses than any build I’ve played before, high damage, and the clear speed isn’t terrible. It also can be run on a decently low budget (10 exalts, give or take), but has a ceiling of 50-100 exalts, which allows for a ton of improvements as you go. I love this build, and I plan to make it my sixth level 100 character! 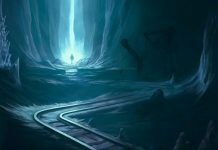 Next articlePath of Exile: Is Delve Overpowered?